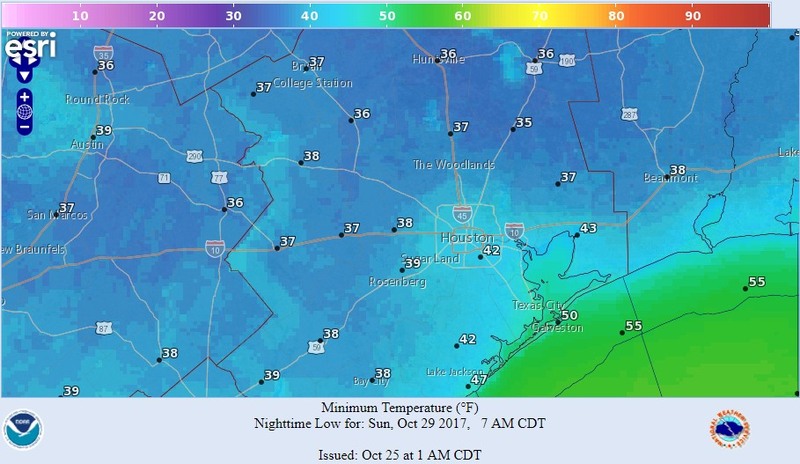 The record low temperature for October 29th in Houston is 39 degrees—and there’s a chance we just might beat that on Sunday morning. Yes, the air mass moving into the region this weekend looks just that cold. And after a chilly weekend, temperatures should rebound for pleasant conditions on Halloween. 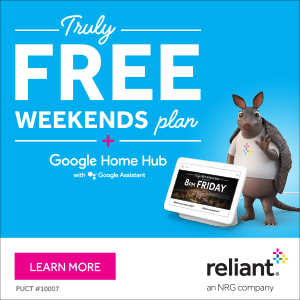 After a cool start to Wednesday, with much of Houston in the mid- to upper-40s this morning, we’re going to have absolutely splendid weather with highs in the upper 70s across the region. Look for another pleasantly chilly night, with lows in the upper 40s inland, and 50s for the southern half of the region. Gulf moisture returns Thursday, setting the stage for a bit of a warmer day with a high in the low 80s, under sunny skies. Overnight lows will only fall into the lower 60s. But then, yet another front will move into the area on Friday. With just enough moisture moving onshore Thursday, a front moving through the area on Friday morning will bring a chance of scattered showers during the morning and afternoon hours. 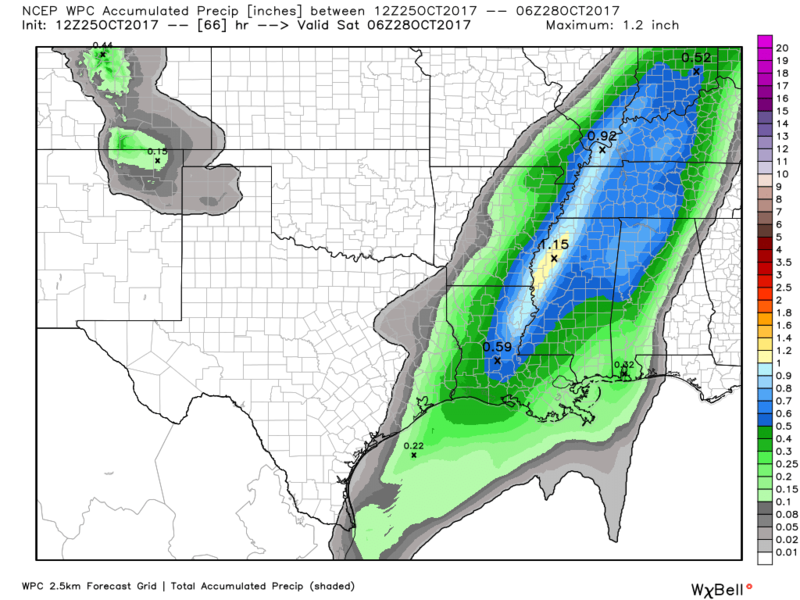 None of the models are overly bullish on rain chances, and people that do see rain probably will see a tenth or two. Conditions will clear later in the day under breezy northerly winds. Lows Friday night will fall into the mid-40s for central Houston, with colder conditions north, and warmer toward the coast. Saturday will be sunny and cold, a bonafide winter day in Houston with high temperatures of around 60 degrees, which is nearly 20 degrees below normal. This will set the stage for a colder night, with lows in the 30s to the north and west of Houston. It’s not clear how far 30 degree nights will creep into Houston. But if not the upper 30s, it will be in the lower 40s—quite cold. (The record low for Bush Intercontinental Airport is 39 degrees, and Hobby Airport is 42). Under sunny skies on Sunday, highs should rise into the upper 60s. Warmer conditions will return by Monday of next week, and Halloween should be a partly sunny day with a high in the upper 70s or about 80 degrees. We can’t rule out a slight chance of rain during the day, but right now I don’t think it will be anything that spoils trick-or-treating. I expect temperatures to be a pleasant 70 degrees, or so, around sunset when the action begins. Been waiting for weather like this since May! See you outside!! I haven’t worn long pants since May.